According to the Centers for Disease Control and Prevention, 47.2% of Americans age 30 and older have advanced gum disease. While gingivitis only affects the gums, periodontal disease can affect your gums and the bones that support your teeth. Thankfully, preventing gum disease can be easy when you schedule regular dental checkups and practice good oral hygiene. Continue reading to learn how our family dentist at NorthPointe Family Dental can help you avoid gum disease through teeth cleanings and other types of preventative dentistry. Gum disease is caused by untreated dental plaque buildup on your teeth and gums. While you’ll still need a dentist teeth cleaning to get rid of tartar (hardened plaque), brushing your teeth at home will remove most plaque. 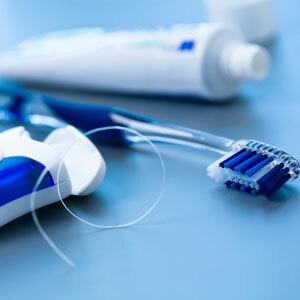 Make sure you also floss once daily to remove plaque hiding between teeth and along the gum line. Gum disease is caused by untreated plaque buildup, so make sure you practice good oral hygiene every day. Vitamin C deficiency has been found to be one of the leading causes of gum disease. Eating more oranges, strawberries, kiwis, or even Vitamin C supplements can help boost your resistance against gum disease. Vitamin C has healing properties that can stop gums from bleeding and swelling—common gum disease symptoms. Not only is a balanced diet good for your smile, but it can help improve overall health. Be sure to stay away from sugary foods and drinks that can lead to tooth decay and gum disease. A balanced diet filled with vitamins and minerals will boost your immunity and help prevent gum disease. Before putting something in your grocery cart, be sure to check the nutritional information on the package. Many of the foods and drinks we believe to be healthy can contain high levels of sugar like fruit juices and sports drinks. While it may seem weird to think about, saliva is one of our best natural defenses against dental plaque. After you eat a meal, your body produces more saliva to wash away plaque and food particles. To maintain a healthy smile, make sure you drink plenty of water throughout the day. Also keep in mind that certain drinks (like coffee and alcohol) can dehydrate you. During a teeth cleaning, a dental hygienist will be able to remove plaque from teeth. Later on, your dentist will be able to check for the signs of gum disease so you can maintain a healthy smile. While gingivitis is reversible, periodontitis is not. However, if your dentist discovers advanced gum disease, they will be able to do scaling and root planing to help prevent receding gums and other oral health issues. Since patients with periodontitis have deep gum pockets around teeth, your dentist will recommend gum disease treatment. Dr. Yun DDS at NorthPointe Family Dental is dedicated to helping patients maintain healthy smiles by offering teeth cleanings and other preventative dentistry services. To schedule an appointment with our Grand Rapids dentist, call (616) 288-6134.